When Jennifer Lawson’s faculty lab mentor, Associate Professor Ramesh Raina, recommended she apply for the Beckman Scholars Program, Lawson ’14 wasn’t so sure. 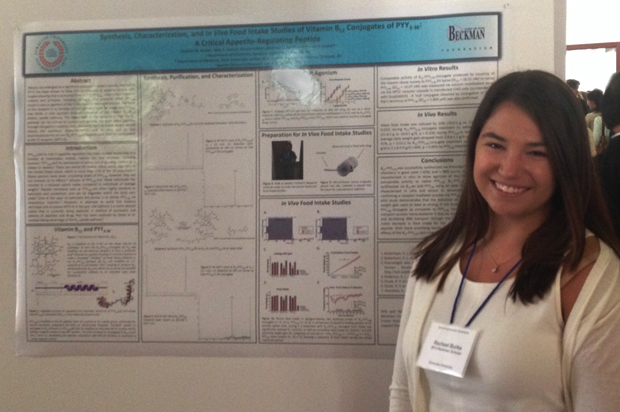 In a poster session at the Beckman Symposium, Beckman Scholar Jennifer Lawson ’14 explains her research. It was a boost of confidence when she was awarded the scholarship for student researchers in her junior year—and a boost to her future when it helped her secure a research position at Boston Children’s Hospital. Lawson and Rachael Burke ’15, a triple major in biology, psychology and ethics, both finished up their work as part of the Beckman Scholars Program for science majors this summer. They were the final two of five scholars selected for the program by Syracuse University, which was one of nine institutions to receive the award from the Arnold and Mabel Beckman Foundation in 2011. Beckman Scholars receive $19,300 in financial support over two summers and a full academic year for laboratory research, scientific meeting travel funds and research supplies. Burke applied for the scholarship after her faculty mentor, Professor Robert Doyle of the chemistry department, spoke to her about it. “It was a great chance to get two summers of 9 to 5 minimum research experience doing your own project, beyond what a typical undergraduate experience is like,” she says. Burke, who joined Doyle’s lab group in her sophomore year, received the Beckman scholarship in the spring of her sophomore year. The focus of the research has been using a particular combination of vitamin B12 with a specific neuropeptide—molecules that signal the brain to do certain activities—to serve as an appetite suppressant in an oral form for people who are clinically obese. 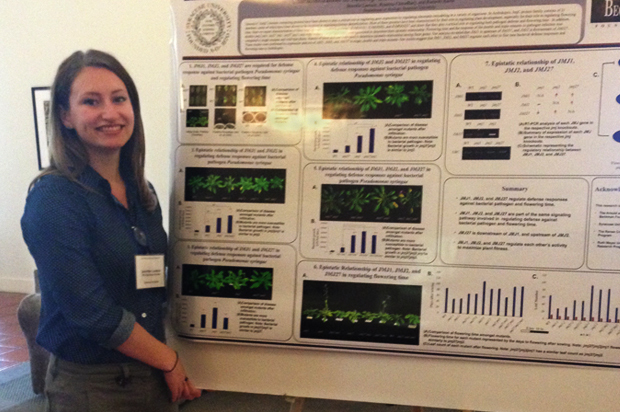 Beckman Scholar Rachael Burke ’15 details her research during a poster session. Using B12 is a way to protect the peptide, which would otherwise be destroyed by stomach acid as it goes through the digestive process, until it goes into the bloodstream. Burke’s role centered on building a specific B12 and PYY combination that they knew would not work to serve as a negative control to confirm whether the active compound was working as they hoped. Burke is working with Doyle on writing up their results and submitting a paper. Even though the scholarship ended this summer, she will continue to work in Doyle’s lab, where she works with a graduate student, and will mentor a new student to the lab. Lawson, who wants to pursue a medical career, had been working in Raina’s lab in the biology department since she was a first-year student. Lawson’s work with Raina involved the characterization of histone demethylases— a particular class of proteins—and their role in plant-pathogen interactions. As part of the Beckman program, scholars attend an annual symposium at the Arnold and Mabel Beckman Center of the National Academies of Sciences and Engineering in Irvine, Calif., held this year in August. Along with Professor Doyle, Burke and Lawson attended and the students presented their work in the poster presentation. 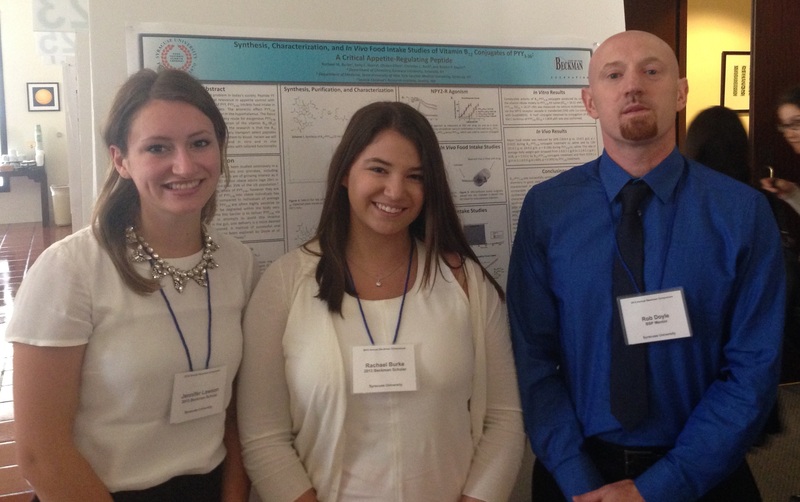 Lawson and Burke were joined by Professor Doyle at the annual Beckman Symposium in August. Beckman Scholars from across the country met up with scientists and researchers in various fields to network and share ideas and questions. “It reinforces the idea that the sciences really do collaborate among each other,” Lawson says. Among the many opportunities provided by the Beckman scholarship, the program taught Burke about discipline and determination. When she got stuck on a project that wasn’t working, she had time to refigure and move forward. “The award meant doing good science and really seeing no limits,” says Burke, who plans to pursue medical school along with clinical research. Lawson sees how the Beckman scholarship helped propel her career and how it highlights the importance of undergraduate research. “It showed me that undergraduates do have an impact on the greater science community,” she says.